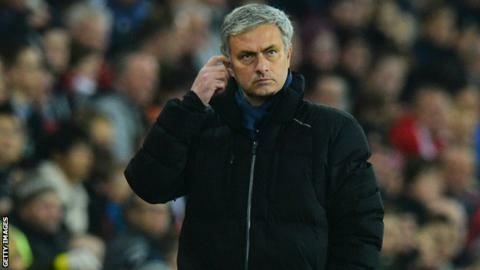 Chelsea manager Jose Mourinho says he has no plans to sign any new players during the January transfer window. Mourinho believes that his current squad can deal with the workload of competing in four competitions. "We cannot be better than first in the League, top of our Champions League group and in the quarter-finals of the Capital One Cup," he said. The Blues face Hull City in the Premier League on Saturday without injured goalkeeper Thibaut Courtois. Petr Cech will replace the 22-year-old Belgium international, who has a "minor" muscular injury. Cesc Fabregas is suspended, but Serbia midfielder Nemanja Matic returns from a ban after missing the 2-1 defeat at Newcastle last weekend. Chelsea will play six matches in the 20 days between Saturday's Premier League clash with Hull at Stamford Bridge and the visit to Tottenham on 1 January, and Mourinho says he intends to rest his senior players during the Christmas period. "The ones who play all matches will have to go to five, but I have to give them one rest." The former Porto, Inter Milan and Real Madrid manager has granted his European-based players a two-day break next week after the Capital One Cup quarter-final against Derby County at Pride Park on Tuesday. Mourinho said: "It allows the players from England, Belgium, France and Germany to go and have a nice dinner with their families - it is the only two days I can give them because they need to be back on Friday to play on Monday [at Stoke in the Premier League]."